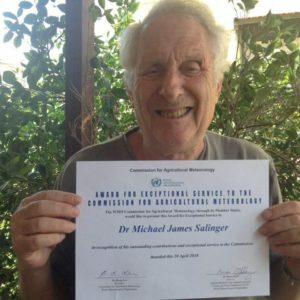 The Award for Exceptional Service has been given to Dr Jim Salinger for outstanding contributions and exceptional service to the Commission for Agricultural Meteorology (CAgM) of the World Meteorological Organization (WMO). “Very few people receive this award so I am very honoured,” Jim told AgScience. The commission’s role is to provide guidance in the field of agricultural meteorology by studying and reviewing available science and technology; to propose international standards for methods and procedures; to provide a forum for the examination and resolution of relevant scientific and technical issues; to promote training and the transfer of knowledge and methodologies, including the results of research, between WMO members; and to promote international cooperation. Jim has been a member of the commission and New Zealand’s principal delegate from 1986 – 2010, and has been a member since, totalling 32 years. During that period he chaired several CAgM working groups and expert teams, was its vice president for eight years, and was its ninth president from 2006 – 2010. Subsequently he has chaired a task team. “So as well as guiding the policy and work plan of CAgM for member states, I have produced many publications,” Jim said. His next task is to provide an update of Climate Variability, Agriculture and Forestry. Technical Note No. 196, 1994: Climate Variability, Agriculture and Forestry. Report of the CAgM-IX Working Group on the Study of Climate Effects on Agriculture including Forests and of the Effects of Agriculture and Forest on Climate, WMO-No. 802, 152 pp. Technical Note No. 199, 1997: Climate Variability, Agriculture and Forestry: An Update, Salinger, M.J., Desjardins, R., Jones, M.B., Sivakumar, M.V.K., Strommen, N.D., Veerasamy, S. and Lianhai, W., WMO-No. 841, 51 pp. Technical Note No. 200, 2000: Climate Variability, Agriculture and Forestry: Towards Sustainability, Salinger, M.J., Desjardins, R.L., Janzen, H., Karing, P,H., Veerasamy, S. and Zipoli, G., WMO-No. 928, 41 pp. Salinger, M.J., Sivakumar, M.V.K. and Motha, R. (eds). Increasing Climate Variability and Change: Reducing the vulnerability of agriculture and forestry. Springer, Dordrecht, 362 pp. 2005. Salinger, M.J. (ed). Climate and Oceanic Fisheries. July 2013. Special issue of Climatic Change.